This weekend it's farewell to County Kerry for us. On Monday we're moving to the beautiful village of Dunfanaghy (dun-FAN-a-he) in Co. Donegal. 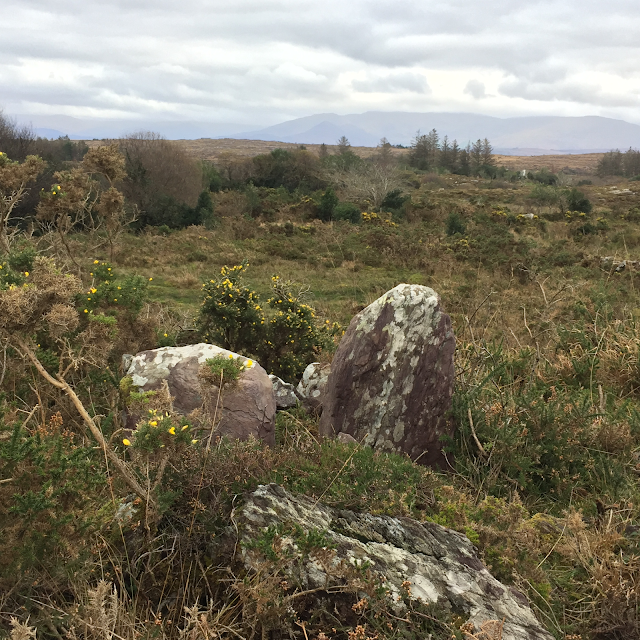 We decided to move there because it too is beautiful, and sparsely populated, and home to lovely people—yet quite different from Kerry. Ordinance map of Dunfanaghy area. It's the journey, not the destination. These last few weeks, we've been making a few final visits to our favorite places. 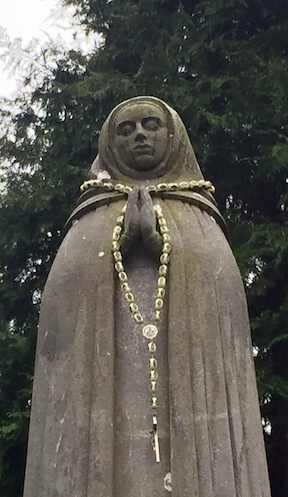 Wednesday, we visited St. Gobnait's Shrine in Ballyvourney. As you can see from the photo, she was as emotional about it as we were. Her healing spirit and technical prowess will inspire me always. 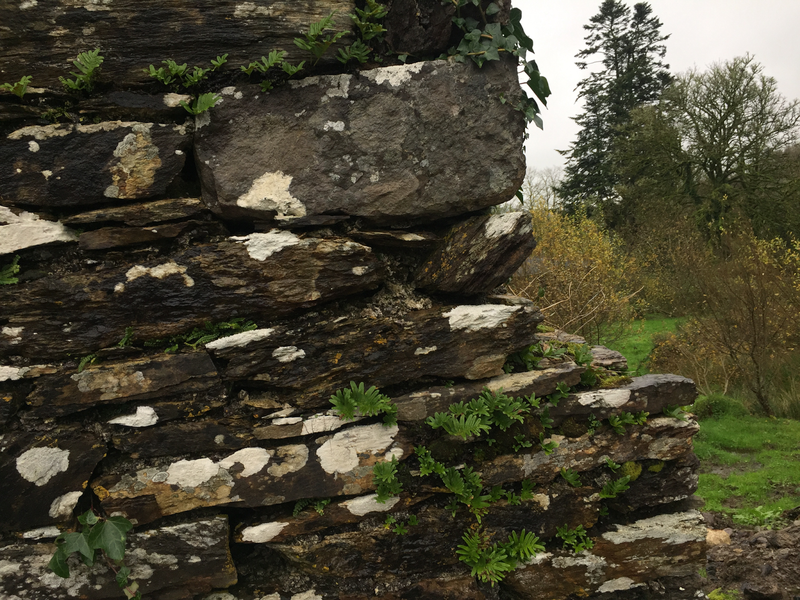 One last time I kissed the Ballyvourney stone, and jumped through the window as I asked the sheela-na-gig to bless my creativity. Artemis asked me later if the sensation of the Ballyvourney stone stays on my lips for the rest of the day, and I said that it did. The new Sheela that emerging in lichen is still there. Can you see her? 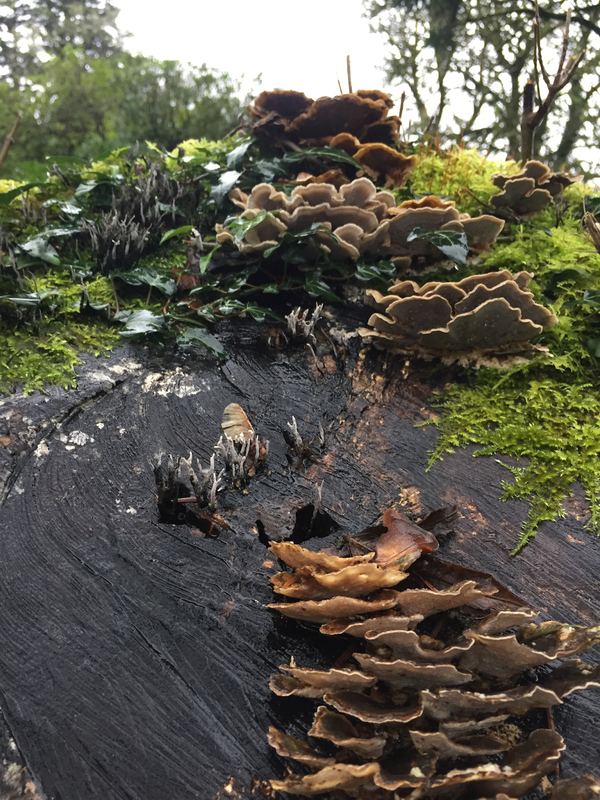 Mushrooms on a stump near the lower well at St. Gobnait's. Also this week I finally visited a monument that I've seen on the map for months, right down the road from our house. Description: This site is located on the crest of a NE-SW ridge which is flanked on W and S by the Bunnow river and overlooks Kenmare Bay to S. It consists of a three-stone row, 5.1m to NE of which is an enclosure. The stone row is 3.1m long and is orientated NE-SW. The stone at NE stands 1.7m high, inclines slightly to SW, and measures .45m x .2m at base. The second stone, .45m to the SW, leans heavily to NW; it measures 1.3m x .54m x .3m. A large prostrate stone, 2.35m x .6m x .4m, lies 1.05m to SW. When erect, it may have been the tallest stone in the row. The adjacent enclosure may be a kerb circle, as defined by Lynch (1979, 2). 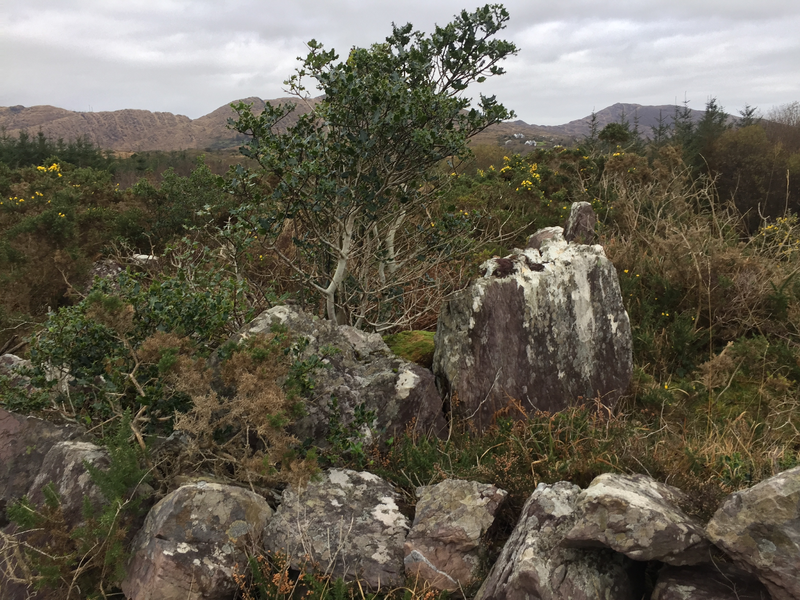 It is a roughly circular area, 7.25m N-S x 6.7m E-W, which is delineated by a kerb of contiguous upright slabs enclosing a low pile of boulders, small stones and quartz. The orthostats, many of which incline outwardly, average .9m high and .8m x .2m at base. A field boundary incorporates some of the slabs at SW, and a gap at NW is obscured by overgrowth. The enclosure is marked 'Killeen Burial Ground' on both editions of the OS maps. I didn't find a rock with "ancient writing" on it either, darn it. But the circle was heavily overgrown with gorse and brambles, so maybe it is still there. I didn't know what a "kerb circle" is, so I looked them up. Kerb circleA series of low orthostats set with their long axes on the circumference of a circular enclosed space of diameter c. 3-22m. The interior is usually devoid of any structure or other remains. They are associated with Bronze Age ritual monuments (c. 2400-500 BC). Kerb Circles are so called because it’s thought they may have enclosed and supported a stone Cairn or earth mound. There clearly is a low circle around larger stones in the center. Perhaps if I had found it earlier in the summer I would have had time to ask permission to clear it and spend a long time among the stones. The stone row from the middle of the circle. These kerb circles aren't sun circles like the others that I've written about that appear to predict astronomical events. These are the remains of a building or cairn. I didn't see any signs of a cilleen, but the spot is lovely, with a view of the Bay, and this little corner of Ireland called Derreenauliff. 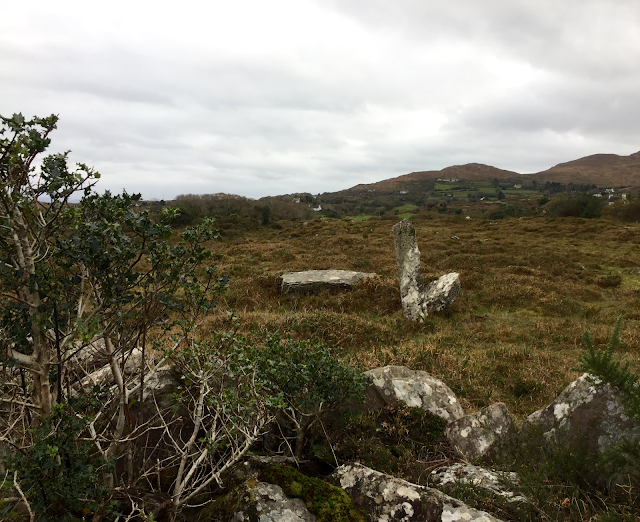 Looking toward Kenmare Bay from the middle of the circle. The stone row was as magnificent and magical as any Stone Row in a guidebook, and here it is, unknown to all the megalithic websites, just at the end of our little country lane. Somehow, we're going force ourselves to leave all this. We have devised a few lures. First, since it's an eight hour drive from here to Dunfanaghy, we'll stop overnight in Galway. Artemis found a four-star hotel that allows pets but costs about the same as a two-star. We like nice hotels. To make the trip go faster, we'll be listening to a few Irish cultural podcasts. 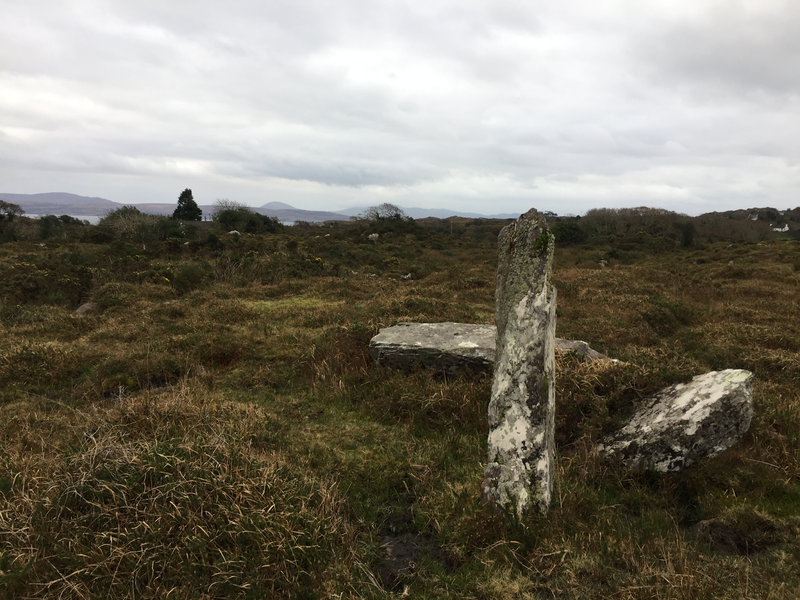 Story Archaeology examines Irish mythology and literature using tools of linguistics, history, worldwide folklore. The question has been asked many times of why Irish mythology hasn't been mined for modern retellings like other cultures. I certainly don't understand it. The Irish History Podcast is a podcast that I've only recently started listening to. The current series is about the 19th-Century British Genocide in Ireland. It's well written, with lots of first-person sources that must take forever to compile. I love it and am glad I'm only finding out about it recently because there are hours and hours of it. Finally, Blúiríní Béaloidis / Folklore Fragments, is released monthly by the National Folklore Collection at UCD. I now have a healthy appreciation for fairy forts, and know more about Lughnasa than ever before. The next podcast will be about The Moon. So that's what I'm thinking about today: our continuing Irish adventure, and our friends back home who are celebrating Thanksgiving. 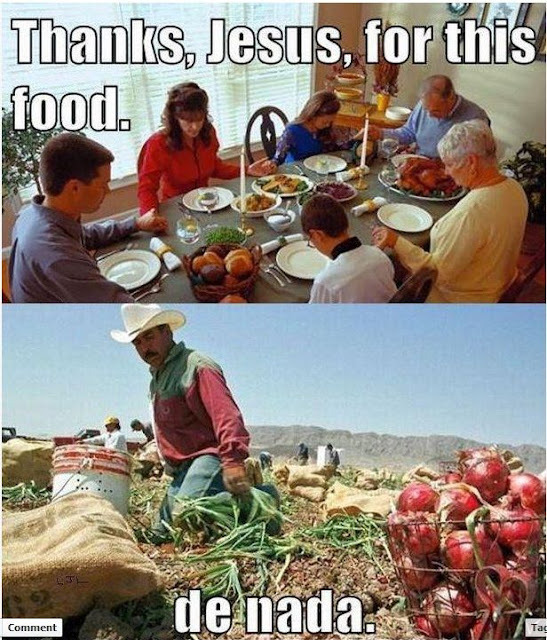 Thanksgiving is just a Thursday in Ireland, but I'm no less thankful.